The state of California and San Diego County have a variety of water conservation programs and everyone is encouraged to take advantage of them. Through the state, business and homeowners can receive $2 per square foot for taking out grass and putting in other plants or landscaping. This covers plants and other landscaping features. 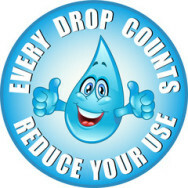 Visit their website at socalwatersmart.com for more information about all of their programs. In addition, San Diego County is offering $1.50 per square foot for turf (lawn) replacement for homes and businesses but with a few more requirements. The area must be 400 square feet or more, yard must be visible from street, and does not include vegetables (but does include herbs, trees, and soil amendments). Visit their site at sdcwa.org for more information.